Hello everyone! 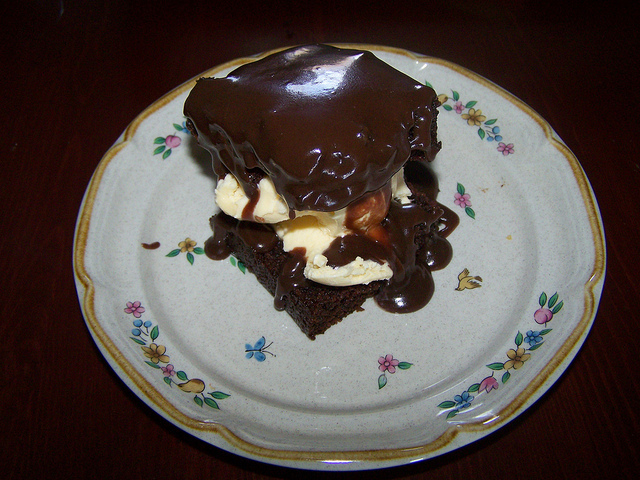 �I thought I would share with you all a picture of this delicious dessert I made yesterday. �Now bear in mind that by just looking at this picture you have probably added 500 calories to your day but believe me it is SO worth it. �I made the cake from Cheryl’s recipe-buttermilk chocolate cake. �So that is the healthy part of the dessert. �Then I made the hot fudge sauce from this recipe-hot fudge sauce. �When I used to work outside the home, one of the girls I worked with always brought this to our dinners. �I had not had it in at least 15 years, maybe more. �It is delicious. �For me to say this is pretty amazing as I am not a chocolate person. We are enjoying BEAUTIFUL weather here today. �It is 55 degrees right now with tons of sunshine. �Feels like spring!! �Tomorrow is supposed to be even warmer, I think. �We did, however, �have freezing rain this morning. �Everything was covered with ice. �The sun and warm temps have melted all of that away. �We do still have patches of snow though. Well, I better get busy. �Lunch break is almost over. �Enjoy your day and God bless.